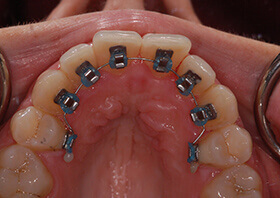 The demand for alternatives to traditional braces has given us more solutions than ever before. STb is a truly invisible system of lingual braces, which means the braces are bonded behind teeth, where they’re hidden from view. With STb braces, patients get all the benefits of traditional braces without the immature-looking appearance. Dr. Sasson is pleased to offer STb braces as an alternative to traditional and aligner braces. With so many options, you’re sure to find a solution that’s best for the long-term health and appearance of your smile.